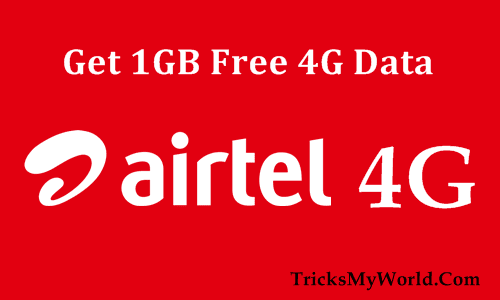 Airtel 4G Free Data Offer: Airtel is offering 1gb 4g data absolutely free for 90 days. This offer is valid for Airtel 4G users who upgraded from 3G sim to 4G sim only. You can get this free 1gb 4G data offer by just giving a missed call. If you are Airtel user then don’t waste your time upgrade your Airtel 3g sim to 4g sim and get free 1gb 4g data. We had already posted and still live an offer that get Airtel 1.2GB free data for just download 4 apps. How to get this 4g offer? just follow below steps. Now wait for few minutes and You will get a Successful message that “You got Airtel 1GB 4G free data for 90 days"
Use this Airtel 4G data in 4G mode only else amount will be deducted from Your Main balance (If you change 2G or 3G mode). Use the 4G data only after confirming data balance. The Airtel 4g offer is working fine in almost all states in India. Offer tested working in Andhra Pradesh, Delhi, Haryana, Maharashtra, Tamil Nadu, Karnataka, Kerala, West Bengal. So try this offer in your state then comment below the offer work or not.